Human body actually belongs to nature and nature is embedded with healing power for every bad stuff that happens in the body. Nature has a cure for almost every disease and so is heart diseases. 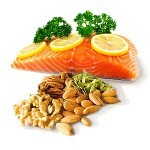 Food that contains maximum amount of omega acids include fatty fish such as salmon, trout, anchovies, sardines and herring. Other sources are Flaxseed, walnuts, green purslane and other leafy greens, seeds and nut oils comprise large amount of fatty acids.